A player resident in a community represented by a club with house league and/or a team entered in a category for which he is eligible to play, must register with that club except where such player’s services are waived by that club subject to the provisions of MR3.12. A player who is eligible but resident in a municipality with no minor team in any group for which he is eligible, shall sign with the club which is the next closest centre. The distance shall be measured from the player’s residence to the two or more municipalities concerned, by the shortest route (excluding toll roads) and by mileage shown on the search engine dictated for OLA registrations for the current playing season. Such player must return to his own municipality the next year of play. 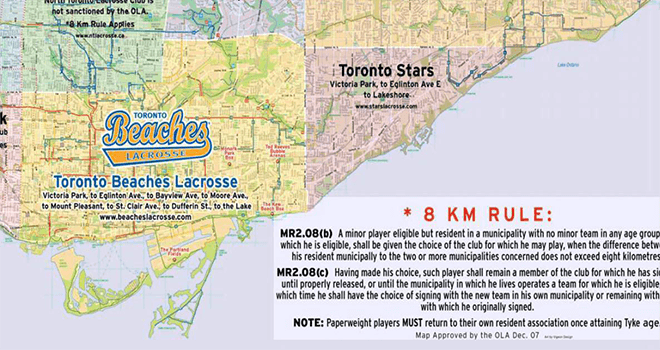 The Toronto Beaches Lacrosse catchment area is from Victoria Park to Eglinton to Bayview to Moore Ave to Mount Pleasant to St Clair to Dufferin to the Lake.